In this paper, a physical method to prepare copper-nickel alloy particles in the sub-micron range for possible self controlled magnetic hyperthermia treatment of cancer is described. It is reported that an increase in tumor temperature decreases the tumor resistance to chemo- and radiation therapies. Self controlled heating at the tumor site to avoid spot heating is managed by controlling the Curie temperature of the magnetic particles. The process described in this paper to produce the nanomagnetic particles allows for a large scale production of these particles. The process used here is mainly composed of melting of the Cu-Ni mixture and ball milling of the resulted bulk alloy. Both mechanical abrasion and continuous grinding were used to break down the bulk amount into the desired particle size. It was found that the desired alloy is composed of 71% nickel and 29% copper by weight. It was observed that the coarse sand-grinded powder has a Curie temperature of 345 K and the fine ball-milled powder shows a temperature of 319 K – 320 K.
Self regulating magnetic hyperthermia can be achieved by synthesizing nanomagnetic particles with desired Curie temperature. In this study the desired range of Curie temperatures was obtained by combination of melting and ball milling of nickel-copper alloy. Localized hyperthermia technique using magnetic particles, based on proposal brought forward by Gilchrist in 1957, continues to be an active area of research. It has been found that the viability of cancer cells is reduced and their sensitivity to chemotherapy and radiation increase when the human or animal malignant cells are heated to temperatures between 41–46°C [1–3]. Magnetic hyperthermia provides the heat at the site of the tumor invasively by applying an external alternating magnetic field to the magnetic particles at the tumor site. The particles will heat up and conduct the heat to the tumor cells. The use of materials with Curie temperature in the range of 41–46°C is desired to provide a safeguard against overheating of normal cells, due to the decrease of magnetic coupling in the paramagnetic regime (above Tc). The binary alloy copper-nickel shows a promising magnetic phase transitions in the desired range of temperature for hyperthermia treatment of cancer. The phase equilibria system for copper-nickel shows a linear progression for the Curie temperature, which starts at a composition of 67% nickel and 33% copper (by weight) for a temperature of 0°C . From the phase diagram of Cu-Ni alloy, the optimum amount of nickel in the alloy is determined to be 71–71.4% by weight to have a Curie temperature in the desired range of 41–46°C. A Cu-Ni alloy for hyperthermia applications has been produced first by Lilly et al . They fabricated self-regulating implants via physical melting. Bimetallic nanoparticles can be synthesized by a wide variety of physical methods, such as, sputtering , mechanical alloying (ball milling) [7, 8], eletrodeposition  or partial recrystallization of amorphous materials . Most of the methods yield two-phase nanocrystalline materials. For instance, Guo et al. have produced composite Cu-Ni nanostructures via an electrodeposition and template-based process. Natter et al. used a pulsed electrodeposition process, enabling the control of grain size and chemical composition of the deposited material. Control of the composition in the nanolevel is difficult , since molecules and atoms in common techniques (e.g. chemical vapor deposition, plasma vapor deposition) do not necessarily arrange in the preferred composition, which was determined on bulk material on the macroscopic level. In the present study we used a simple process that combines melting and ball milling of bulk materials. Koch  has reviewed the facts of ball milling (mechanical alloying) and its impact on nanostructured materials, indicating that ball milling can produce average grain sizes below 100 nm. Even though Natter  has shown that the chemical composition can be controlled via pulsed electrodeposition; and deposition on a porous substrate could possibly yield nanoparticles, it is nevertheless a complex process requiring expensive equipment, the control of several parameters and a lot experience. Additionally, this process is not feasible for industrial high-scale applications. The nickel-copper alloy was obtained via physical melting, in which nickel powder (AlfaAesar, 325 mesh, 99%) and copper powder (AlfaAesar, 500 mesh, 99%) were mixed in the desired composition (71% nickel, 29% copper; w/w). In order to obtain a highly homogenous composition over the resulting bulk alloy, the mixture was ball milled for 2 hours, before it was placed into an alumina crucible. The mixture was heated up to 1465°C for 3 hours under nitrogen (prevention of oxidation). The liquid temperature of the alloy is 1365 °C  – a higher temperature was used in order to avoid inaccuracies due to differences between actual and set temperature. Basically, two steps are necessary to break down the bulk chunk to the desired particle size. The first one is done by any mechanical abrasion for producing a powder texture that enables the subsequent use of a continuous grinding media as a second step. This effort made use of simple and automated grinding at first and additional grinding up in a ceramic ball mill for at least 3 to 7 days. It was carried out in a wet environment using acetone in order to enhance the mixing of the content that is being milled and to prevent oxidation and the development of a metallic particle gas that is toxic and not collectible. Ten ceramic (alumina) balls were used for 5 g of starting material. The ball weight to content weight ratio was 6. The rotation speed of a jar (40 mm in diameter) was 120 min-1. After decanting from the jar, the dispersion was dried in vacuum. A highly dispersed grayish-metallic suspension was obtained after the first day of ball milling. A JEOL 2010 transmission electron microscope was used to determine the particle morphology. A ZetaPALS Particle Size Analyzer (Brookhaven Instrument Corp.) was used to determine the particle size. Magnetic properties were measured using an MPMS 5 SQUID magnetometer. Wide angle X-ray diffraction pattern was taken in a Siemens 500 X-ray diffractogram with CuKα (λ = 0.154 nm) radiation. Ni-Cu alloy is a relatively soft material (Rockwell hardness of B25  for a Ni-Cu 70:30 alloy) compared to a Rockwell hardness of N80 for alumina , offering the possibility for further mechanical treatments in order to achieve desired particle sizes. The size of the particles is restricted by the smallest diameter of human blood vessels to approximately 400 nm. 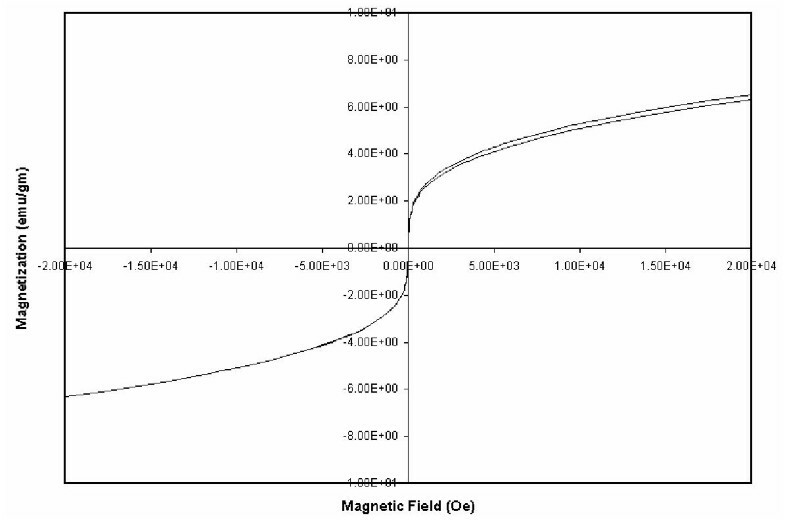 Figure 1 shows the magnetization of the as-produced bulk alloy as well as the grinded and ball-milled powder in a magnetic field of 100 Oe. It indicates for the as-produced bulk alloy a complete phase transition from ferromagnetic to paramagnetic behavior at 97°C (370 K), which obviously does not fall into our target temperature range. 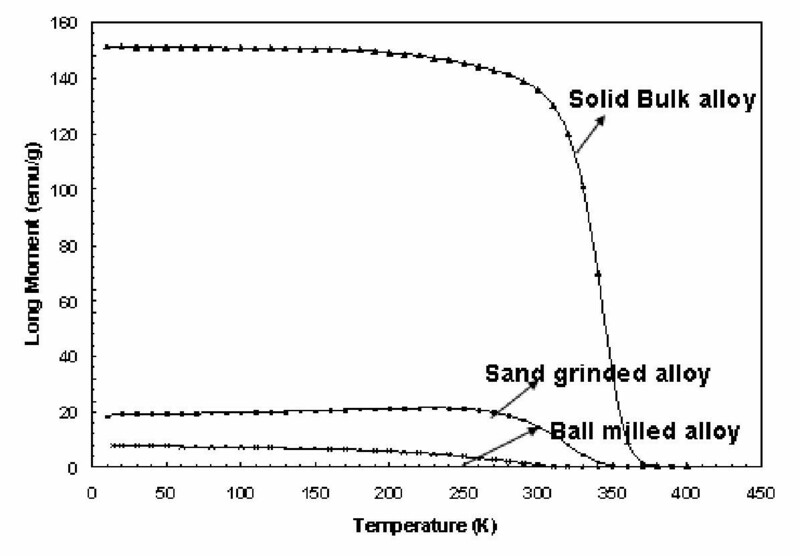 From Fig 1 one can see clearly a shift towards the target temperatures for the grinded and ball-milled powders. The coarse sand-grinded powder (particle diameter < 150 μm) shows a Curie temperature of about 72°C (345 K) and the fine ball-milled powder (effective particle diameter: 436 nm) shows a temperature of 46°C – 47°C (319 K – 320 K). Curie temperature is also related with the lattice constants. It has been reported  that with an increase in lattice constant the Curie temperature increases. Based on the electron diffraction pattern (Fig 2) and the wide angle X-ray pattern (Fig 3), the d-spacing value (between the 111 planes) has been calculated and the result has been shown in Table 1. It has been found that the d-spacing changes from 2.045 in the sand–grinded bulk alloy to 2.036 in the ball-milled Cu-Ni alloy particles. This might be the reason for decrease in the Tc value in ball-milled powder. By ball milling nanostructure is obtained by repeated mechanical deformation by using a number of milling balls and the internal strain in the crystalline structure caused the change in the d-spacing. Fig. 4 shows the hysteresis plot of the ball-milled fine powder. There is no remanent magnetic moment at room temperature indicating the superparamagnetic  behavior of Cu-Ni ball milled powder. Magnetization and magnetic phase transition (Curie temperature) of the as-produced, sand grinded and ball-milled copper-nickel alloy (29% wt. copper, 71% wt nickel), from top to bottom, respectively. 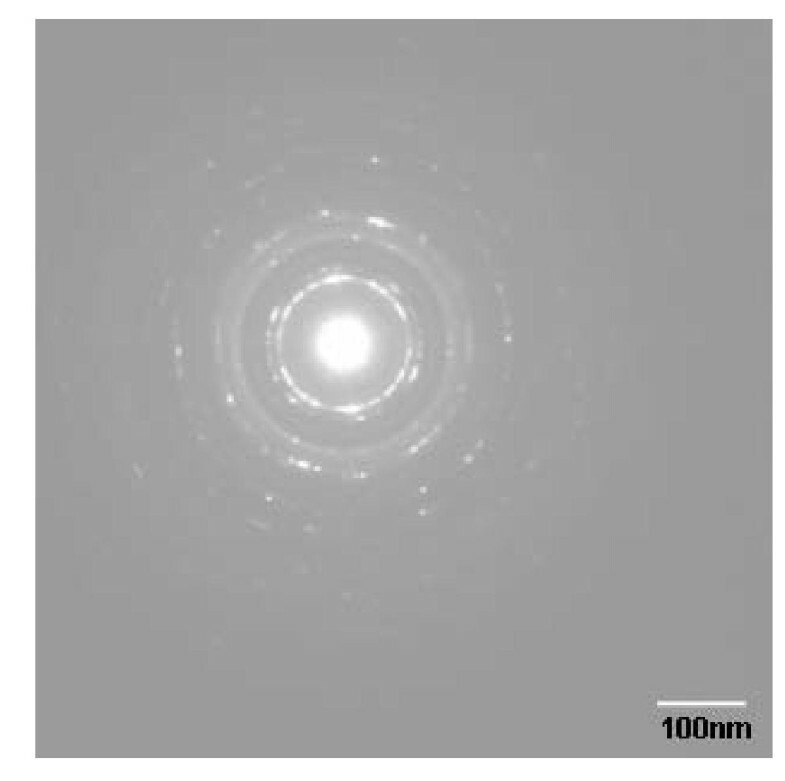 Electron diffraction pattern for ball milled Cu-Ni particles. Wide angle X-Ray diffractogram for sand grinded Cu-Ni particles. Hysteresis plot of the ball-milled powder at 300 K. Magnetic behavior is similar to that of superparamagnetic materials. Comparison of XRD on sand grinded powder and Electron Diffraction on ball-milled powder. Transmission electron microscopy (TEM) analysis and particle size analysis verify that sub-micron particles are obtained by this mechanical alloying method. 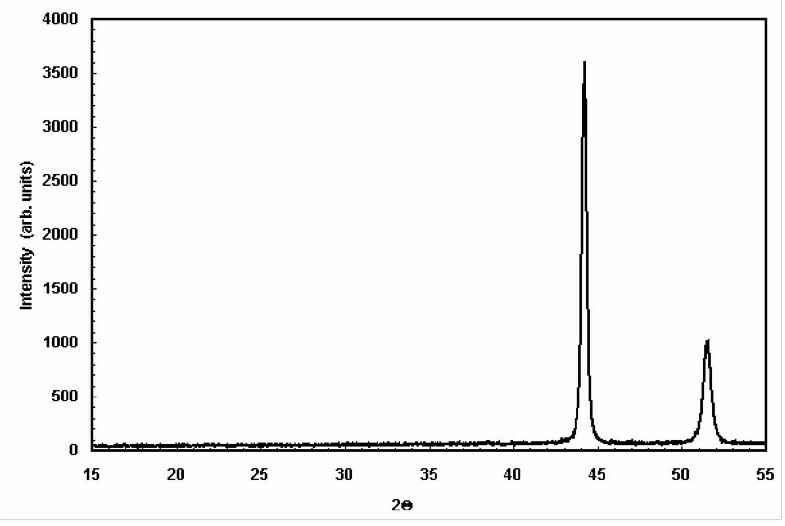 The particle size was measured after ultrasonication of an aqueous dispersion for a few minutes and resulted in an effective diameter of 436 nm with a half width distribution of 218 nm. The preceding ultrasonic step is essential for particle size measurements, since metallic nanoparticles tend to agglomerate within a liquid medium. Figure 5(a),5(b),5(c) was taken from an ultrasonicated and highly diluted dispersion. 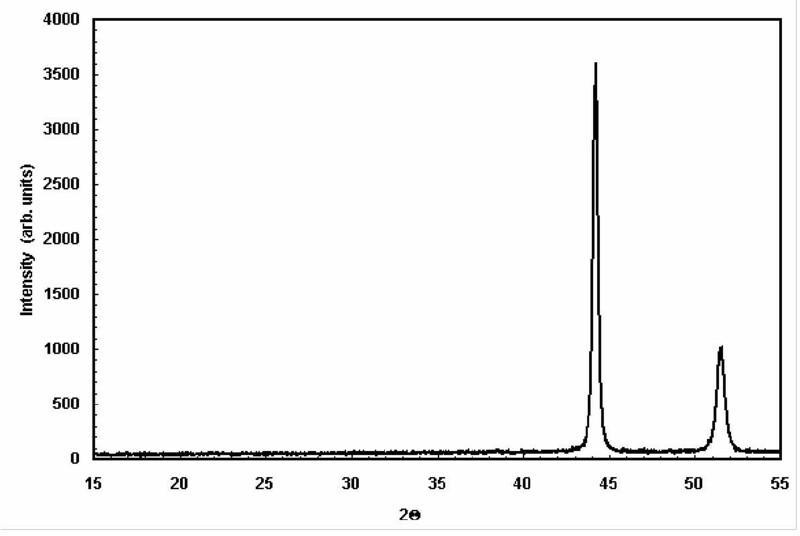 The particles that were found during TEM analysis (using a JEM-2010, JEOL) ranged from around 100 nm to a few micrometers. The population of spherical particles (Fig. 5(a), ~100 nm) was very low compared to particles with flake-like geometry (Fig. 5(b)). In these flake-like particles submicron grains and boundaries are also observed along with little contrast. Since copper and nickel have almost the same density (Cu 8920 kg/m3, Ni 8908 kg/m3) and similar face-centered cubic lattices with nearly the same lattice constants, changes in contrasts are only due to different particle thicknesses. The texture of the particles reflects clearly the abrasive nature of the ball milling process. Fig. 5(c) is a highly magnified (×200000) micrograph of the solid texture of a single (micron sized) particle showing clearly a polycrystalline structure with its grains and boundaries. The grains have sub micron dimensions. (a) Cu-Ni nanosized particles (spherical) after ball milling for 7 days. (b) Cu-Ni nanosized particles (flake-like) after ball milling for 7 days. 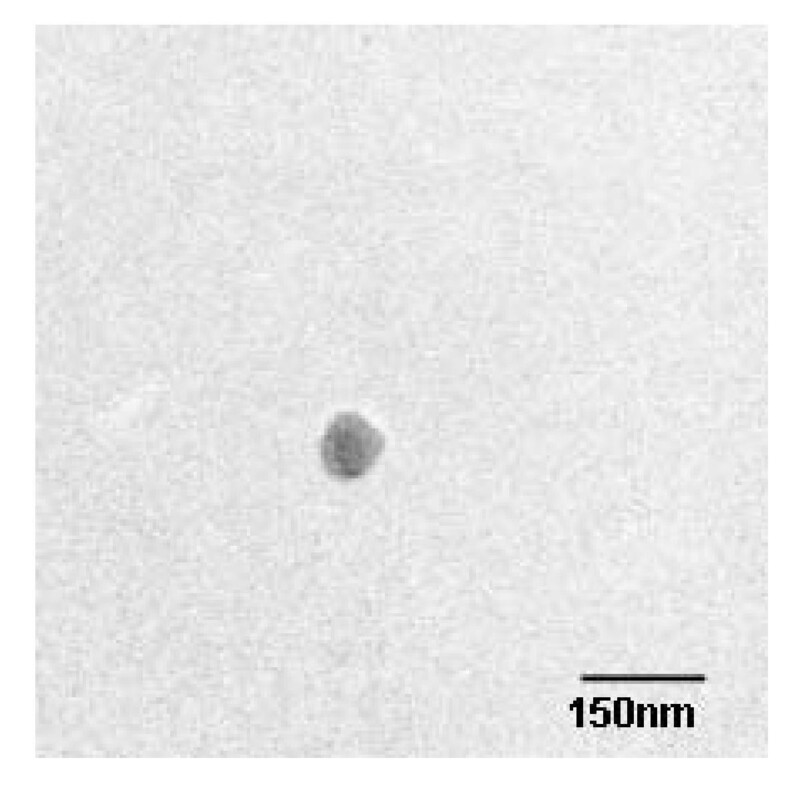 (c) High magnification (200000×) TEM micrograph of a Cu-Ni particle showing its polymorph structure. Self regulating magnetic hyperthermia can be achieved by synthesizing nanomagnetic particles with desired Curie temperature. The desired range of Curie temperatures can be obtained by varying the weight percentage of nickel and copper based on the phase diagram. Generating particles in sub micron size is extremely important to vary the Curie temperature. Ball milling leads to generate submicron particles very effectively. Combination of melting and ball milling is also effective to produce alloy particles in large quantity; hence it is a commercially viable process. However to control the monodispersity of the magnetic components and the uniformity in their distribution throughout the matrix is not very easy. But this non-equilibrium process has the advantage of generating sub-micron alloy particles easily that might not be possible using other techniques. The biocompatibility and toxicity of the produced Ni-Cu nanoparticles have not been investigated in this study. However, biocompatible coatings could be used to minimize the metallic interaction with biological structures. This work has been supported by the Center of Excellence grant from the Florida State University Research Foundation. Mr. Martin Bettge (a research assistant) and Dr. Jhunu Chatterjee (an assistant scientist) at the Center for Nanomagnetics and Biotechnology worked under the supervision of Dr. Yousef Haik. The three authors contributed to this work equally. All authors read and approved the final format of the paper.